Would you like your very own Green Wall? 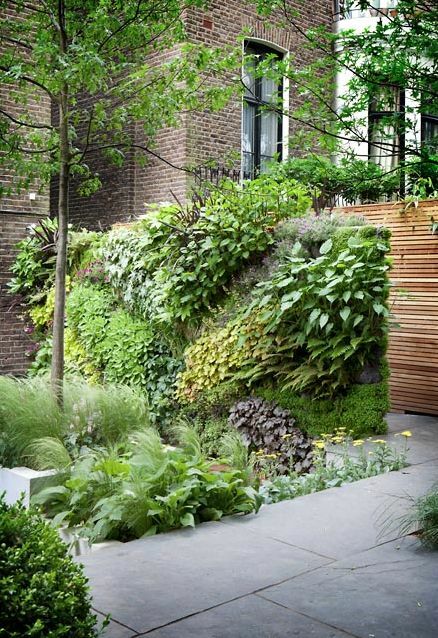 We’re very much fans of green walls and happy to see them increasingly finding their way into domestic gardens. Pretty much all of the same benefits apply in a private setting as in a public area; if they’re on the house itself they act as insulation, protect walls from the elements, and act as a sound proofing barrier. They provide habitat for a wide variety of insects and for birds, improve air quality and it’s uplifting and relaxing for us to see such a wall of greenery and colour. They are also a great use of space, you can pack a lot of plants into a small area and use other areas of the garden for a deck, seating area, lawn or outdoor kitchen, trees….. whatever you want. If you’ve got a small garden or roof terrace, they’re definitely worth considering and can even be used to grow herbs, vegetables or strawberries. To create these vertical gardens, plants are rooted into a structure that is attached to a wall and an irrigation system is a good idea.